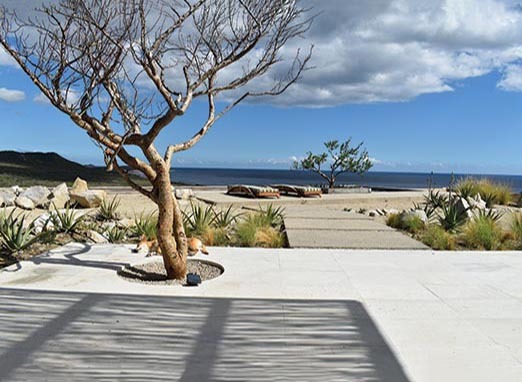 Like all great beauties, Ranchito El Nido is gorgeous from every angle, in any light and any weather. 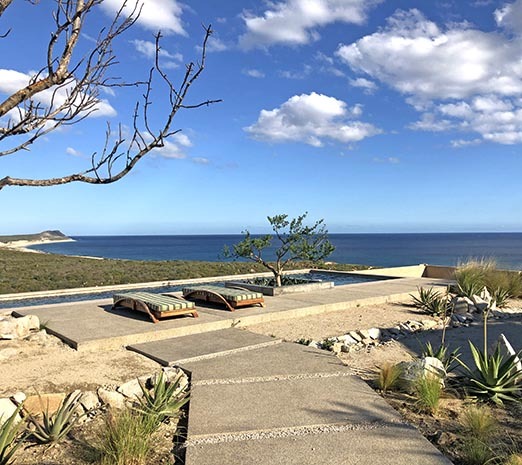 It sits up high on a hillside in Laguna Hills, the peaks of Playa Gorda in the distance, a long, clean, blue curve of the coastline at its feet. Hawks glide overhead in the quietude. “Breathtaking” would be a cliché, but there are no better words to describe this scene, so clear and wide and open. I have written here and here about my love for the wilderness and ocean at East Cape. 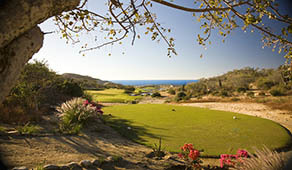 And we’ve had grand adventures filming in this area, in Playa Gorda, Zacatitos, El Encanto and Las Barracas. 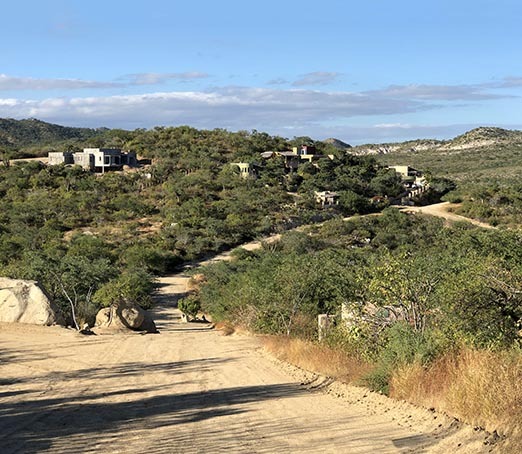 So it was with interest that we set out for Laguna Hills, a lovely gated community next to El Encanto, another exclusive community not far from downtown San Jose. The road to the house zigs and zags up the hill. You climb up and then go down before you finally arrive at the crest where it is situated, an ascent that gives the feeling of leaving it all behind and entering a faraway place. 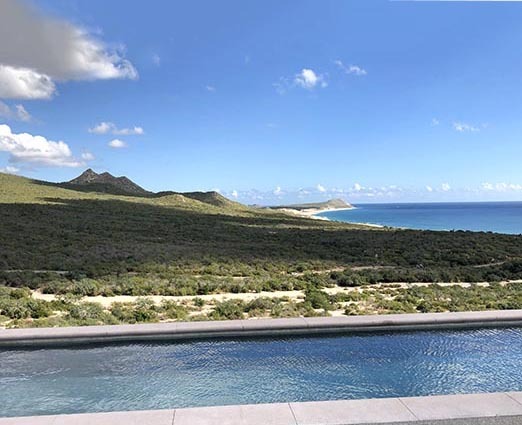 In this regard, Ranchito El Nido, or Little Nest Ranch, is perfectly named. 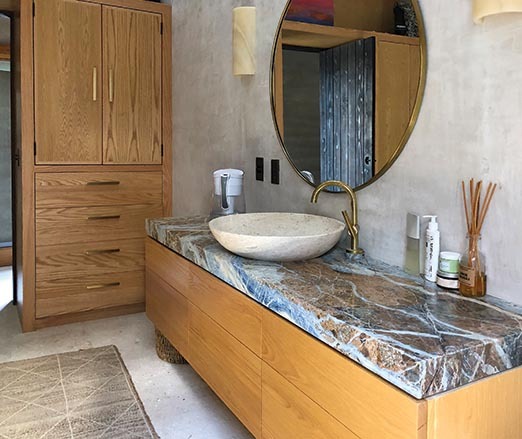 High up with the soaring birds, secluded with just the occasional sound of leaves rustling in the breeze, you are indeed in a cozy, private aerie. This is the home of artist Leah Porter, owner of Casa Dahlia art gallery in old town San Jose, and her husband, John Woods. Building a house was not something they had in mind when, three and a half years ago, friends told them this lot had become available. 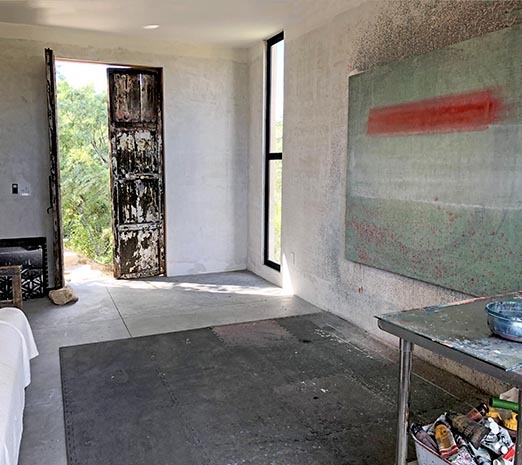 Leah knew the area well because her father, the artist Dennis Porter, had one of the first homes in Laguna Hills back in the 1990s. When they went to see the property, it was love at first sight. As Leah describes it, “I knew we were in trouble as soon as I saw the expression on John’s face.” Very quickly, even though they had only been dating a few months, they decided to purchase the land and build a house together. Pretty gutsy, considering neither had done any building on this scale before. Construction began almost immediately under the auspices of architect Gonzalo Elizarraras and builder Juan Jose Palomares. It ended officially the day we visited, with workmen removing their last piece of equipment. The house embraces both modern and traditional. Its horizontal profile, clean lines and open layout make it an outstanding example of contemporary residential architecture. 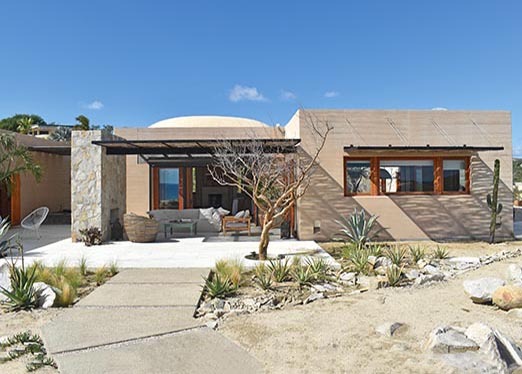 Yet solar panels pair with a boveda ceiling while traditional Mexican wooden shutters stand in for modern hurricane windows, a more charming and equally effective solution. 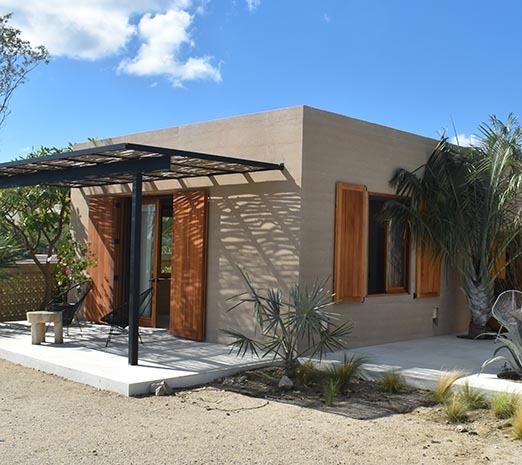 I appreciate the use of local materials, the rocks that are so ubiquitous, and sticks from the palo de arco tree. 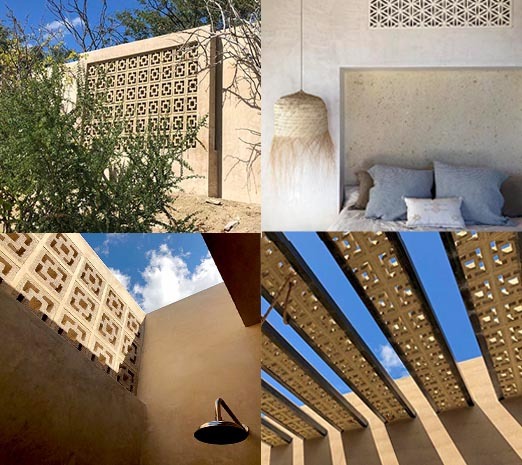 But the most defining feature are the walls made from rammed earth, an ancient building technique that is cost effective and eco-friendly. Sand, soil, gravel and some cement are mixed together and then packed tightly by hand or machine into wooden forms. Its like making a sand castle but with forms instead of a bucket. 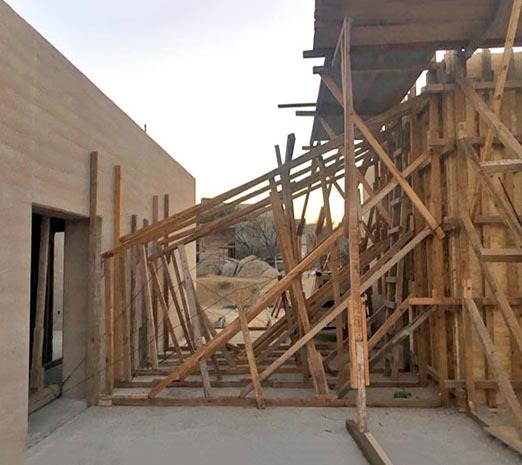 In the case of Ranchito El Nido, every step was done by hand because the construction team’s mixer broke. Once the forms are in place, the wall must come up quickly before the earth mixture dries and hardens. Windows are cut into the wall afterwards. This kind of construction leaves a low carbon footprint because it uses locally sourced materials and produces little waste. 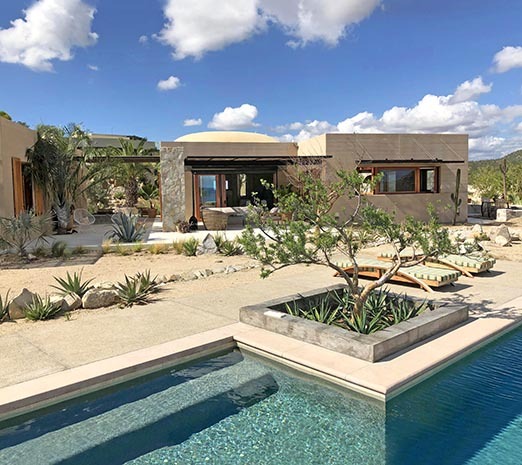 Rammed earth houses are perfect for desert climates because they have excellent thermal mass, absorbing the sun’s heat during the day to keep the interior cool and releasing that heat at night to stay warm. In this way, they require just a third of the energy used in a conventional house. We are happy to see more of these homes coming up in the area. 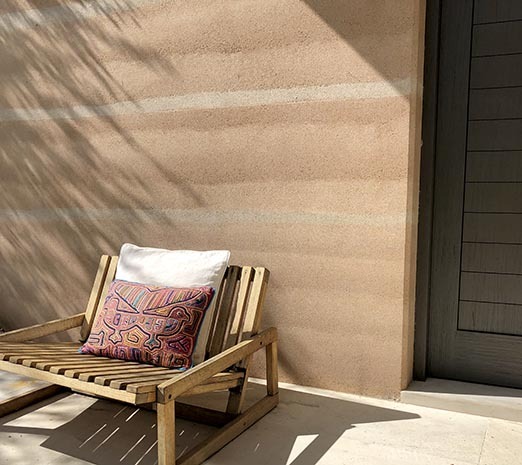 Rammed earth walls are also quite beautiful. Slight color variations in the different layers of earth create subtle, undulating striped patterns. 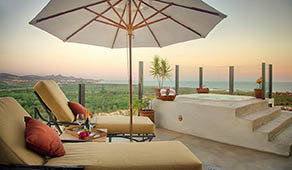 They give Ranchito El Nido an appealing, organic look appropriate to the site and softening its modern edge. 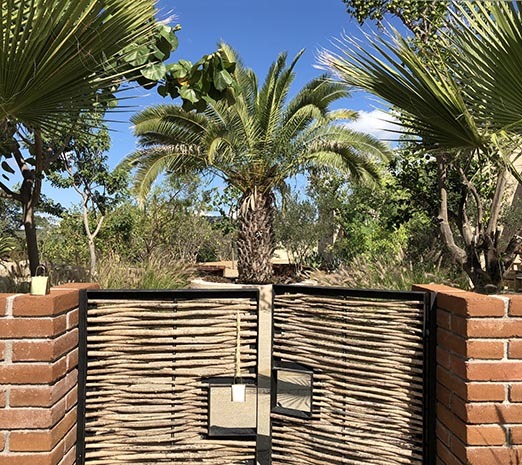 Two sets of palo de arco gates take you into the property. First to the garage area, then to a sunny desert garden and courtyard. 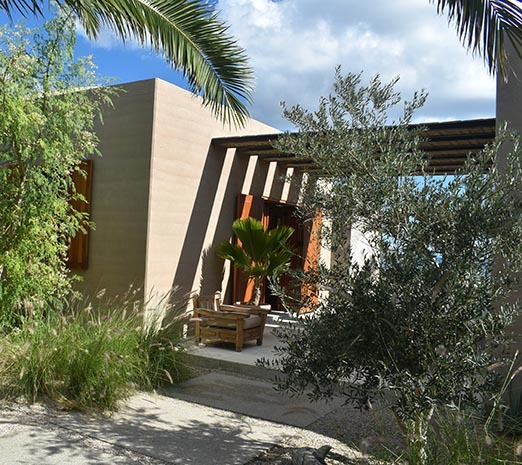 The main house is a simple arrangement of two rectangular volumes linked by a common walkway and seating area. Beyond are a patio and lap pool. 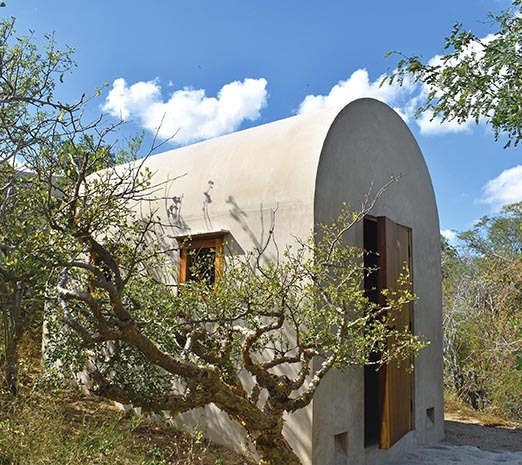 The left building houses the communal spaces, living room and kitchen, while the private quarters, bedrooms and bathrooms, are in their own structure to the right. 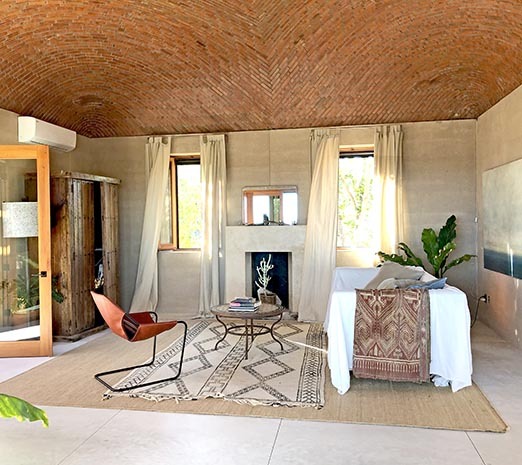 Beams made up of decorative concrete screen blocks link the two parts. The buildings and the beams make a natural frame for an incredible view of ocean and sky. This brilliant square of blue is the first thing you see. The overall feeling is of openness, space, light and peace. 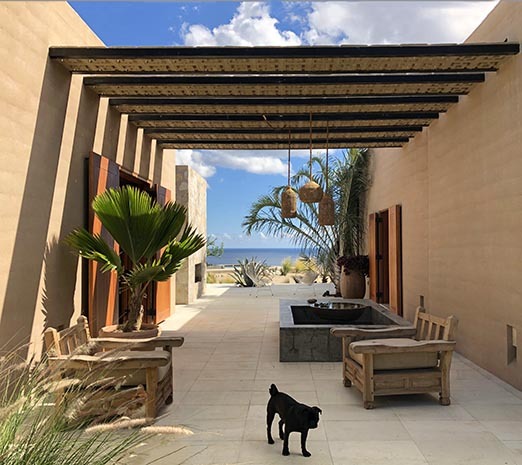 Interiors flow into a back ocean-facing patio and seating area in quintessential Cabo indoor-outdoor style. 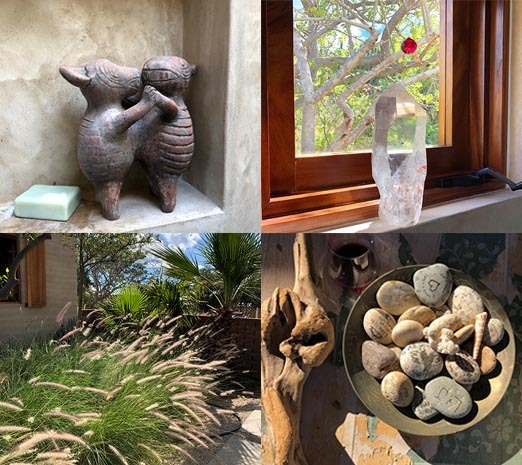 At certain times of day, shadows cast by trees, objects and decorative elements dance across surfaces, giving the whole house a sense of poetry and life. Banks of fluffy desert grasses, cacti and twisty desert trees augment the scene. The decor is homey, simple and understated. For instance, the living room, whose main feature is the boveda ceiling, has just a sheet covered sofa and a leather chair. The kitchen, bright with windows on all sides, also opens onto the patio, making entertaining a cinch. 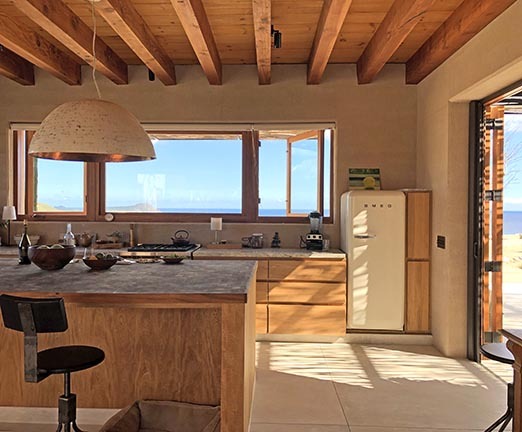 A retro refrigerator, wooden beams, counters and large wooden island continue the quiet aesthetic. 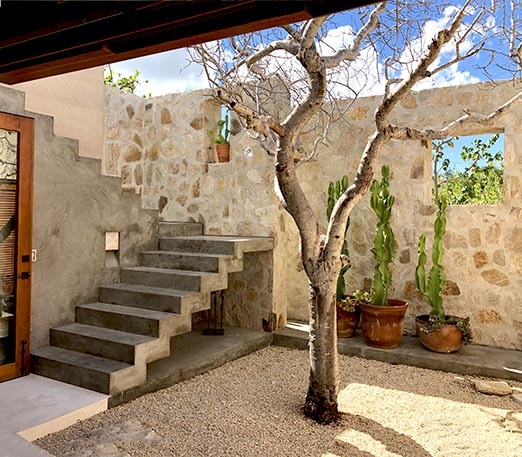 The other end is framed by a tiny courtyard whose dramatic tree, stone wall and stone steps provide another interesting point of focus. On the other side of the walkway, two bedrooms bookend his and hers bathrooms. 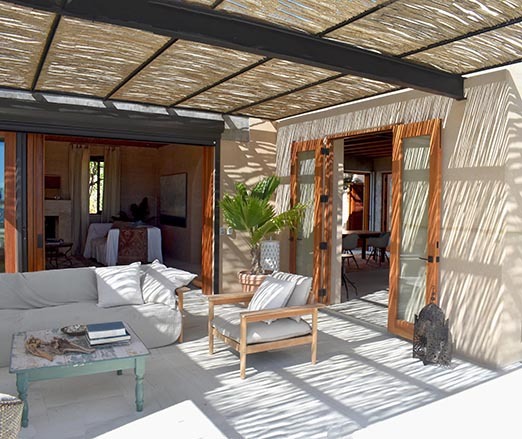 French doors in the master open onto the patio. 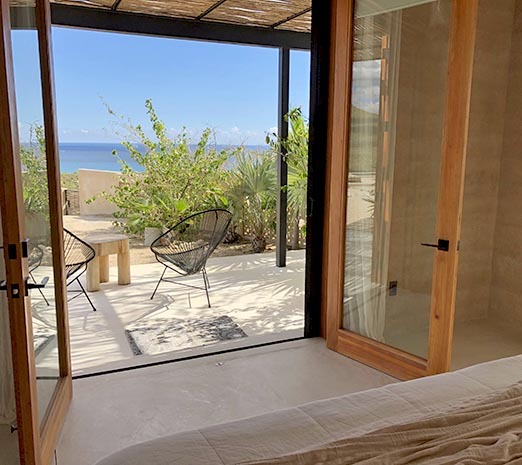 The room faces east, so you can lie in bed and watch the sun rise over the water. 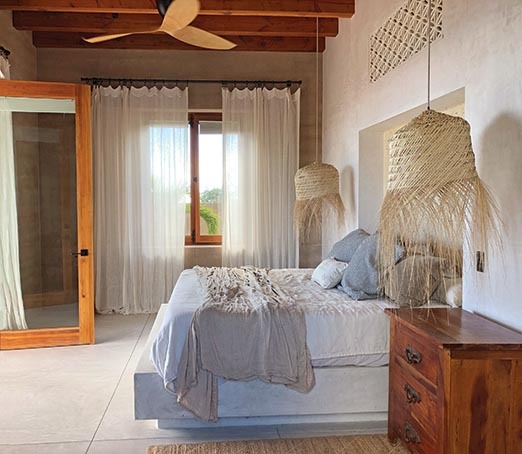 Again, the decor is restful, minimalist and lovely: just a pair of straw hanging lamps and an ornamental tile panel in the wall above the headboard. Decorative squares such as these are used elsewhere on the property to great effect. I like them in the boundary wall, in the shower area and in the concrete beams mentioned earlier. 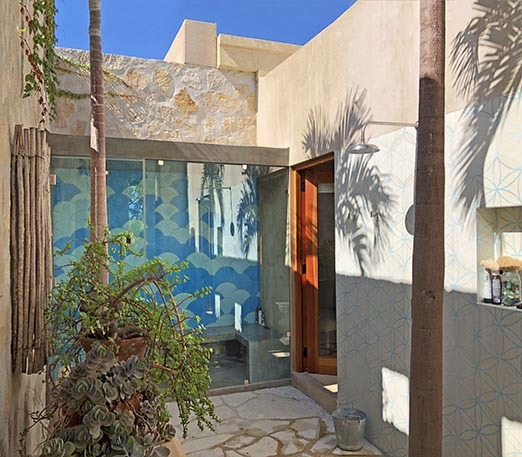 The two private bathrooms share an outdoor shower space which is a fun and surprising feature. On one end is my personal favorite, an enclosed shower with fish scale tiles in bright shades of blue. It is a playful injection of color in an overall palette of whites and neutrals. On the other end is a vintage bathtub. 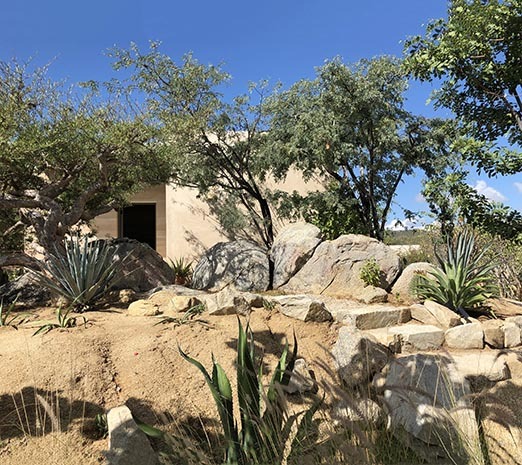 There are three other smaller structures on this one acre property: the one bedroom casita that Leah and John lived in during construction, a little meditation room and Leah’s art studio. You find them on the other side of the courtyard when you enter. The meditation room is exactly that, a snug little room with a barrel shaped ceiling, just big enough for a divan and prayer rug. 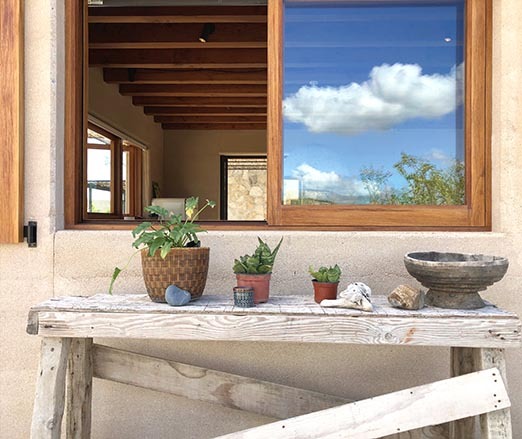 A place to retreat, daydream, do some asanas. Finally, on the edge of the property, shielded by trees and down some stone steps is Leah’s private work space. Leah talks about sacred geometry and how they used the golden ratio to determine the right measurements and proportions- ceiling heights, shapes of doorways and passageways for example. Could this be why Ranchito El Nido is such a standout? 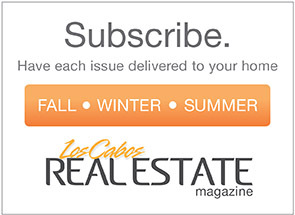 Years ago, when she was still in school, Leah visited her father in Cabo. She took a picture of the ocean from the beach at Punta Gorda, right near where her new home is today. This photo became the reference for her first painting in college. Little did she know then that she had just painted her future. So maybe it is the perfect proportions, or maybe it is the quality of the light, the subtle colors or the power of that view. Or maybe, just like the moment when she took that photo, it is all these things and little bit magic.